New Jersey’s capitol is the most historic building in our state. The term “State House” harkens back to the time of its origination and remains as its popular name. 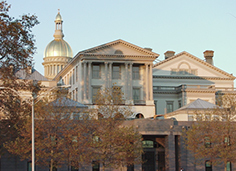 The New Jersey State House is one of the oldest state capitols in the country. The New Jersey State House was built in 1792 by Jonathan Doane. The site was 3.75 acres and cost 250 British pounds. 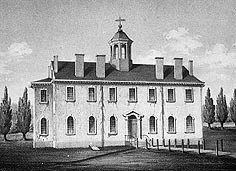 The building was two and one-half stories with a bell tower and seven bays radiating off a center hall. The legislative chambers were on the first floor – the Senate (then the Legislative Council) in the west and General Assembly in the east. The governor’s and judicial offices occupied the second floor. 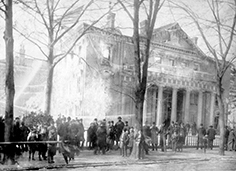 Although state government grew for decades, the State House remained unaltered until a major addition in 1845. John Notman, a well-known Philadelphia architect, created a three-stepped office wing on the north side of the original building facing West State Street. The new entrance had a two-story porch and fluted Doric columns. 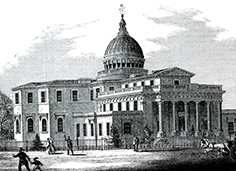 A grand rotunda and stairhall connected the old and new wings, capped by a spherical dome and cupola. A two-story portico with Corinthian columns and classical pediment was added to the river-side facade. In 1865, the river-side portico was extended 68 feet. 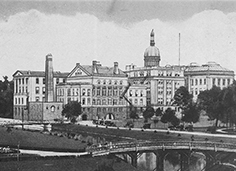 Another major building campaign began in 1871, when Samuel Sloan was commissioned to modify the West State Street wing and design new wings for both legislative houses. The wings flanked the 1865 southern extension. 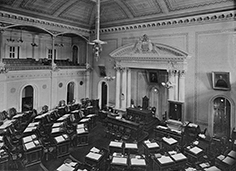 The old Senate chamber became the governor’s office with additional offices created in the former Assembly chamber. Early on March 21, 1885, a fire raced through the empty building, destroying the West State Street wing. Lewis Broome of Jersey City planned the reconstruction. He designed the building in a simplified Second Empire style with three stories and limestone facing. He added a new rotunda and dome which remain as is today. The Assembly wing was replaced in 1891 and designed in late Victorian style. James Moylan, an Assemblyman, was the architect. Moylan rotated the wing to parallel the building’s center wing. This work remains intact. An addition to the west end of the original 1792 structure created private offices for the governor and judges. A third floor was added to the south end of the center wing. In 1900, the wing was extended 95 feet, ending at a water power canal known as the Sanhican Creek. The addition was designed by the architectural firm of Karr, Poole and Lum with Assemblyman George Poole as one of the firm’s principals. 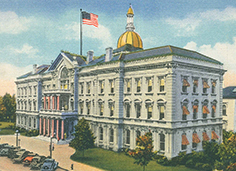 In 1903, under the direction of Arnold Moses, the Senate wing was reconstructed in American Renaissance style to mirror the Assembly quarters. The wing was enlarged using classical forms and rich decorative treatments and has stayed intact since. The original 1792 east wing was replaced with a four-story office section in 1906. The front area was extended on the east side in 1911 and on the west side the following year. In the ensuing decades, no major structural changes occurred aside from the modernization of the main corridor in the late 1950s. 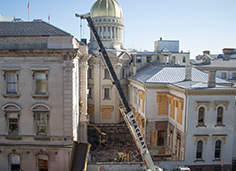 A long-term renovation project began in 1987, which restored the legislative portion of the building and added legislative office space, known as the South Addition. Next, the State House Annex was renovated and a pedestrian tunnel and multi-level parking garage constructed. Hundreds of craftspeople and workers dedicated months – in some cases, years – for specialized efforts in stained glass, gilding, millworking and decorative molding to recreate original details of the chambers, rotunda and Annex. A public-private partnership allowed for the golden dome and interior rotunda space to be refurbished. A Welcome Center, cafeteria and landscaped plaza were added. Under the New Jersey Public Buildings Arts Inclusion Act, state artists were commissioned to create artworks to commemorate new chapters in the capitol’s history. In July 2017, the front portion of the New Jersey State House, including the Rotunda, was closed for renovations. This project is estimated to be completed in 2021. The work is being done by Preservation Design Partnership as contracted by the New Jersey Building Authority, with funding provided by the New Jersey Economic Development Authority. An overview of the project is available here.